The Umiujaq Research Station is owned and run by the Centre d’études Nordiques (CEN: Centre for Northern Studies) whose secretariat is based at Université Laval, Québec, Canada. This station is part of the CEN Network. The station is in the village of Umiujaq, situated on the shores of the eastern Hudson Bay in Nunavik, Québec, Canada (56°33’07” N, 76°32’57” W). The village is located 15 km north of Richmond Gulf (Lac Guillaume-Delisle), an immense inland bay connected to the Hudson Bay via a rocky gulch resembling a canyon. The many rivers flowing into the Gulf make its waters brackish and rich in brook trout, whitefish, seal, and beluga. The sheltered maritime environment features sporadic black spruce and larch, but the surrounding area is rather characterised by shrub tundraA type of ecosystem in which tree growth is limited by low temperatures. The origin of the word is from from the Kildin Sami word tūndâr, meaning "uplands" or "treeless mountain tract". In the northern... More, discontinuous permafrostPermafrost is frozen ground that remains at or below zero degrees Celsius (32 degrees Fahrenheit) for two or more years. 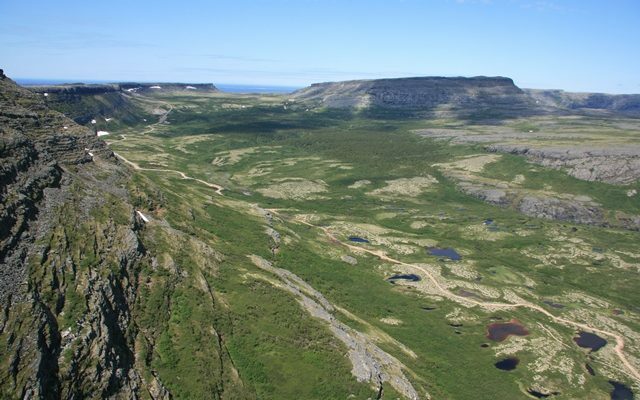 It forms in regions where the mean annual temperature is... More (mostly palsa bogs), and thermokarstA landform that results when ground ice (ice-rich permafrost) melts. The melting leaves small, marshy hollows and hummocks in the land as the ground settles unevenly. See also thermokarst lake.... More lakes. In front of the village are the Nastapoka Islands (cuestas)where many species of birds, such as common loons, eider ducks, and peregrine falcons, find summer shelter and nest. The steep cliffs plunge into the Nastapoka Sound with waters up to 110 m deep. About 30 km north of Umiujaq is the Nastapoka River with its scenic 30 m high falls. The headwater lakes of the river contain a unique population of landlocked freshwater seals and many fish species. A salmon population that does not migrate can be found in the lower course of the river. The estuary waters are rich in brook trout, white fish, seal, and beluga. Access to the Tursujuq Provincial Park, as well as to the marine/coastal-, river-, lake-, mountainous-, deltaic-, and shrub tundra environments, and the migrating treeline, is from Umiujaq. Umiujaq was established in 1986 by Inuit from Kuujjuarapik, 160 km to the south, who decided to relocate in the region where they hoped to better preserve their traditional lifestyle in an area where fish and game were not threatened by development. CEN’s research has been conducted here since 1980. In previous years, CEN researchers used a meat plant/warehouse that has shared ownership (CEN, Anniturvik Landholding Corporation, and Makivik Corporation). In 2010, CEN undertook major station upgrades and restored the warehouse (still shared with its partners), built a vehicle garage, and a three-bedroom house. The facility is next to a pier for easy maritime access and can accommodate seven to eight people at a time. The house is equipped with partial solar powered electricity, running water (kitchen, toilet, and laundry), and oil heating. Past and present research has focused on permafrost studies, coastal geologyThe study of the solid Earth, rocks and processes by which rocks form. 'Geo' is derived from the Greek word for Earth.... More, and geomorphological characterisation of the region. Other research topics cover biodiversityBiological diversity. The many and varied forms of life on Earth (collectively known as biota). As well as diversity of species (species diversity), there is also diversity within populations of a... More and dynamics of northern aquatic ecosystems, impacts of thawing permafrost in the context of global warmingThe enhanced greenhouse effect due to human activity and the resulting widely accepted rising average temperature near the surface of the Earth since the late 19th century (and its projected... More, wetlands paleoecology, research on mercury dynamics (air, precipitation, snow), snow and ice dynamics, greenhouse gasA gas found in the earth's atmosphere that traps heat radiated from the surface of the earth, and causes the earth's temperature to rise. The term comes from the fact... More emissions from thermokarst ponds and tundra, sea and lake bottom mapping, and plant community dynamics and response of northern plants to Climate ChangeAccording to the United Nations Framework Convention on Climate Change, climate change is change in the climate of the whole Earth or a region of the Earth that is believed... More. Archeological studies and community based monitoring activities have also taken place. CEN operates four climateThe average weather we would expect over a long period of time (seasons, years, decades). Climate varies from place-to-place across the Earth. Climate is determined by long-term (over at least... More stations in the area and thermistor cables are installed to monitor permafrost temperature. CEN has extensive climate data since 1997 which is available upon request (cen@cen.ulaval.ca). Umiujaq has a population of about 500 inhabitants, mainly Inuit. The people speak Inuktitut and English with some French. Some research on the social dimensions has been conducted over time. Umiujaq is only accessible by commercial airlines. All research activities must be planned in advance. Maritime transport is available twice a year. Local guides and translators are available for hire. Access to the surrounding area by chartered flights (floatplane and helicopter) can be organized by CEN from the Whapmagoostui-Kuujjuarapik Research Station. Contact CEN (cen@cen.ulaval.ca) for more information.